There are even dorms and instructors and dining facilities, just like a college campus. But with more rules, and uniforms, and military order, of course. Everyone who wears a uniform performs a job in the military that falls within certain categories or career fields. Each branch has a different way of calling these jobs. In the Army, these are called Military Occupational Specialties, or MOS. In the Air Force, the categories are called Air Force Specialty Codes, or AFSC. Based on one’s scores after taking the Armed Services Vocational Aptitude, or ASVAB, test, there are more than 800 careers one can have in the military. Because I was Air Force, my AFSC was 3N0X1. It was the only military job I ever wanted. Within days of graduating from basic training, I was on a plane for Baltimore, Maryland. Unlike the majority of my fellow Airmen, who were headed to other Air Force bases for their training, I was heading to Ft. Meade, Maryland, an Army post that is home to the Defense Information School. I wrote about DINFOS before on the blog, after I was a guest speaker during one of the graduation ceremonies there. Since then, I’ve spoken there a few times to individual classes related to social media and government work. A lot of the people I knew and worked with in the Air Force are now instructors there themselves, to include some folks who went through tech school with me. I was sent to Ft. Meade to attend the basic journalism course for three months. 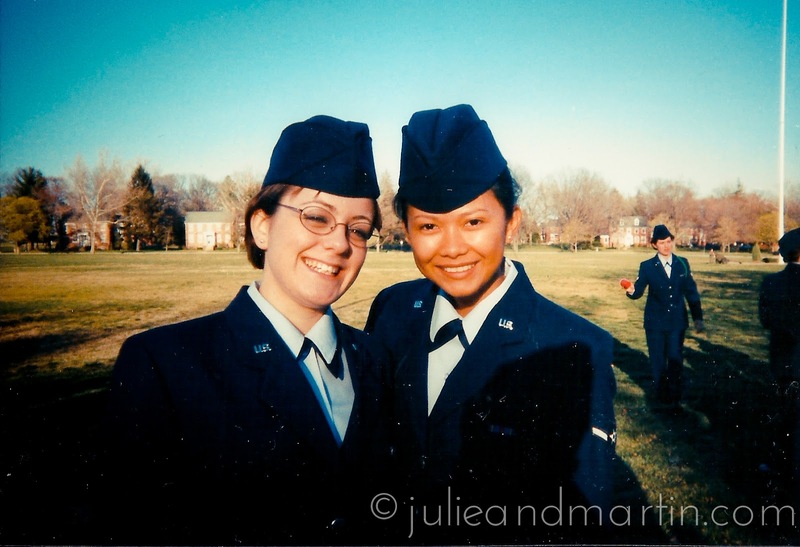 The day I showed up at Fort Meade, I was assigned a roommate, Carolyn, who attended basic training the same time I did, although we were in different flights and didn’t know each other. She was from Minnesota and I was from Cincinnati, and we both were sort of obsessed with Ralph Fiennes and The English Patient at the time. We shared a room in the Air Force dorms which were housed in a long, narrow building right across from the school. We each had a bed, a nightstand, a wardrobe closet, a book shelf and a desk, and we shared an ironing board and mini-refrigerator. And while we still shared a bathroom with all the other girls on our floor, there were individual shower stalls for more privacy. While it was different than sharing a huge bay with 50 other ladies, we were still expected to make our beds every day, line up our shoes underneath, and keep everything dust-free. Not all the Airmen were attending the public affairs course. Some were being trained as photographers. Others were there becoming broadcasters and videographers. A few were learning graphic design. Carolyn was training to become a photographer, which meant I was a frequent subject for her photography assignments. That first weekend there, all the Airmen were involved in a fitness challenge. All the classes were divided up into flights, and my flight was the newest right out of basic training. So collectively, we maxed out on all the scores since we were all in prime condition. For the final obstacle, our commander — a captain who once played football at the Air Force Academy — challenged everyone to a chin-up contest. If someone from our flight could pump out more chin-ups than he, we would get the top prize: a weekend pass with no restrictions. You see, there are “phases” during tech school. I wrote about them in an earlier post, but to sum it up, the phases are in place to ease the transition away from basic. Under normal circumstances, my flight would have remained in the first phase — which meant an early curfew, no civilian clothes, no leaving the base — for at least three weeks. Fortunately, my flight had a few young men who could do chin-ups all day. That first weekend, all of us got to put on civilian clothes again and head downtown to Baltimore. We went to Washington D.C. the next day. On the steps of the Lincoln Memorial during my visit to DC. That’s when I fell in love with this city. It was my first visit ever, and I just knew I would return to it in some capacity at some point in my life. But at that moment, I was focused on Europe. When it came to my classes, tech school was pretty easy for me. From the age of nine, I knew about the public affairs career field, and my curriculum choices in high school reflected my goal to enlist in that career field. All those years in journalism and writing classes, learning about the media, all those public appearances during my theater years and on my mother’s television show really paid off at DINFOS. Public affairs was a perfect fit for me. But where was I going to go after tech school? Like all active-duty Airmen in tech school, I expected to get orders to my first duty assignment sometime in the middle of my schooling there. We all got to fill out a “dream sheet” listing the locations we preferred, and all of my preferences were in Europe – most in Germany. When the instructor said I really should list some stateside bases, too, I explained my reasons for not listing any. Of course, my ancestors came from Germany, and my dad loved it when he was stationed as a young Airman, but any time there was a major international military event, what location was in the news? Throughout my high school years, I paid attention. Ramstein was where distinguished visitors visited and Americans returned from conflict. Notable things happened there. It’s where those injured in the Balkans, or in the 1998 embassy attack in Kenya, were flown. If I wanted to be in the middle of it, in a place where things happened and media activity was constant, I wanted to be there. So, long before there was Martin, there was a desire to speak the language and live and work in Germany on behalf of the Air Force. As a sophomore in high school, I signed up for German classes and took it for three years before signing up to be a foreign exchange student in the summer of 1999. I wanted to be as prepared for the assignment as possible. The instructor laughed when I explained all this, and said my enthusiasm for an overseas assignment would lead me straight to Korea. Another student, though, overheard me. 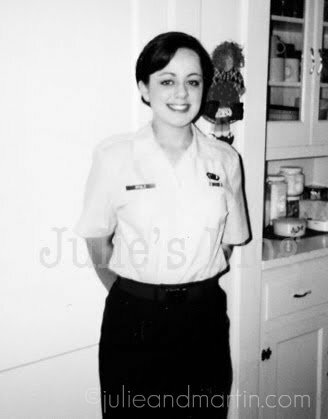 She was a technical sergeant, a Reservist, and was cross-training into the public affairs career field. She didn’t live in the dorms with the new Airmen, but attended classes with us. During our lunch break that day, she wrote an email address on a slip of paper and handed it to me. So, in a moment of inspired bravado, I took the sergeant’s advice and wrote to the chief master sergeant in charge of assignments. I later learned that the email was circulated from Fort Meade to Texas to Germany … throughout my career field’s entire senior leadership, actually. It’s not every day that an airman basic — the lowest rank in the Air Force — writes to a chief master sergeant — the highest enlisted rank in the Air Force — and explains how the Air Force would benefit by sending that brand new baby Airman to Europe. 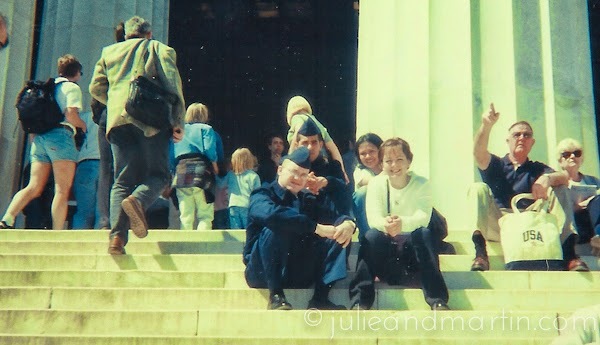 The weekend after I wrote that email, my family from Ohio came out to visit me during the Cherry Blossom festival in DC, and it was the first time they got to see me in uniform since they didn’t attend my graduation from basic training. I was in Phase Two at the time — I could go off-base yet I had to wear my blues uniform. During the first day of their visit, we spent the day walking around the Mall to see the monuments. At the Women’s Vietnam Memorial, a lady approached my father and me. She identified herself as an Air Force senior non-commissioned officer, and wanted to know what I did for the Air Force. When I said public affairs, her face lit up. Needless to say, I started talking. She took down my name, saying she would put in a good word for me to her colleague. About a week or so later, I got my orders to Ramstein Air Base. To say I was excited is putting it mildly. I couldn’t wait to head over to Europe. But I had to finish tech school, of course. In addition to the classes, there were “GI Parties” every Sunday night, when all of us Airmen were assigned household chores, such as mopping the hallways or dusting furniture in the open areas of the dorm. There were random fire and evacuation drills in the middle of the night. Early morning “fun runs” with the squadron. Physical fitness (PT) in the afternoons in the field next to the dorms. Curfew. Random room/uniform inspections. Custom and courtesy drills. But there were fun times, too. I really did enjoy my journalism and photography classes, completing assignments, and hanging out with the others after school or the weekends, when we ventured off base to the local malls and movie theaters, or to Baltimore or Washington DC again. I got a belly piercing in a tattoo parlor right off base. (That was interesting.) And a few of us discovered a thrift shop not far from the base: I invested a nice chunk of my new paycheck on some great vintage finds. And I celebrated my 19th birthday there, too. A group of Airmen and Marines (who lived in the dorms across from ours) took me out for a birthday dinner that weekend, and brought me a cake and candles that morning. I graduated in the last week of May. The ceremony lasted about 20 minutes. I don’t even remember who spoke at it. Later that day, my dad arrived from Ohio to take me back to Cincinnati so I could start two weeks of the “recruiters assistance program” which allowed for me to visit with family before heading over to Germany.